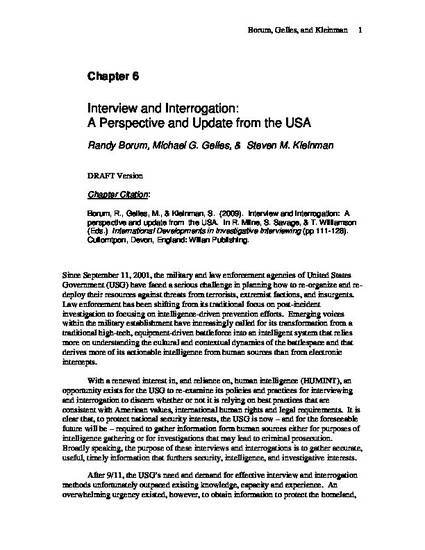 With a renewed interest in, and reliance on, human intelligence (HUMINT), an opportunity exists for the USG to re-examine its policies and practices for interviewing and interrogation to discern whether or not it is relying on best practices that are consistent with American values, international human rights and legal requirements. It is clear that, to protect national security interests, the USG is now – and for the foreseeable future will be – required to gather information form human sources either for purposes of intelligence gathering or for investigations that may lead to criminal prosecution. Broadly speaking, the purpose of these interviews and interrogations is to gather accurate, useful, timely information that furthers security, intelligence, and investigative interests. In this chapter, we review a few recent developments in US law and policy for this vital security-related function and describe a very promising initiative that seeks to chart a course for the future of interrogation, particularly in intelligence-gathering contexts.